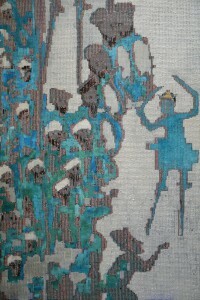 A series from Ja ou Tunis, a symposium on Visual Culture in an Age of Global Conflict. JAOU is hosted yearly at the Bardo Museum, Tunis, Tunisia by the Kamel Lazaar Foundation and this year went ahead despite a brutal shooting of 20 tourists by ISIS in the museum this March. This week’s broadcast features artist Hiwa K, born in Kurdish Iraq, living in Berlin. 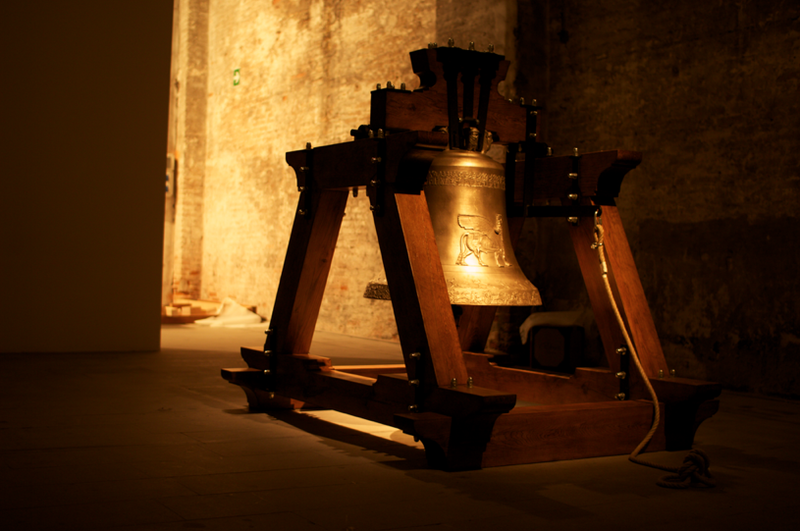 Hiwa discusses his piece The Bell, (pictured) currently on show at the 56th Venice Biennale, in the main exhibition of Arsenale titled “All The World’s Futures”. 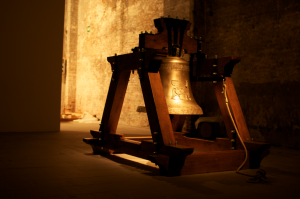 Hiwa made a short presentation on The Bell at JAOU Tunis, a piece which took 8 years to complete and features melted down arms from all over the world, used in Iraq, and turned into a bell ornamented with the classical relief of a lion with a bearded, human head. This entry was posted in Six Pillars to Persia and tagged artist, arts, hiwa k, ibraaz, jaou tunis, kamel lazaar, middle east, podcast, radio, six pillars, venice biennial on June 7, 2015 by sixpillarstopersia. Visiting field recordist form Iran, Niloufar Em discusses Six Pillars’ current residency project at London College of Communication, and the group performance at Queen Elizabeth Hall, Southbank Centre on Friday 13th December, 6pm. Tutored by seminal guitar manipulator Keith Rowe, the group, consisting of six LCC Sound Art and Design graduates and the five visiting Iranian artists, had just 4.5 days to prepare. Here Niloufar also discusses the week of workshops that follow the performance, including a field recording workshop with world-renowned field-recordist Chris Watson. Performers were Niloufar Em, Heckmat(t), Nasim Khorassani, Sepehr Haghighi, Nemo Ghasemi, Howie Lee, Yiorgis Sakellariou, Maria Popadomanolaki, Irina Zakharova, Artur Vidal, Angela Yeowell and Veryan Weston. This entry was posted in Six Pillars to Persia and tagged Art, artist, arts, audio, experimental, female, field recording, field recordist, interview, Iran, Iranian, iranuksonics, middle east, niloufar em, radio, Resonancefm, six pillars, sonic, sound, tehran on December 15, 2013 by sixpillarstopersia. 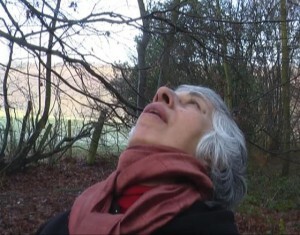 Nooshin Farhid, video artist, whose solo show Shallow Water, Deep Skin is now running at East London’s The Agency Gallery discusses her work and process with us back in 2008. Over the years Farhid has co-curated a number of exhibitions including “Use this Kind of Sky” and has exhibited the world over gathering together a considerable body of work and lengthy resumé. Farhid’s videos employ different subjects and scenarios that thread together with a connecting sense of agitation and grit. We discuss her interests and how Fahid’s ideas form which interestingly harks back to her own experiences as an immigrant settling in the UK. 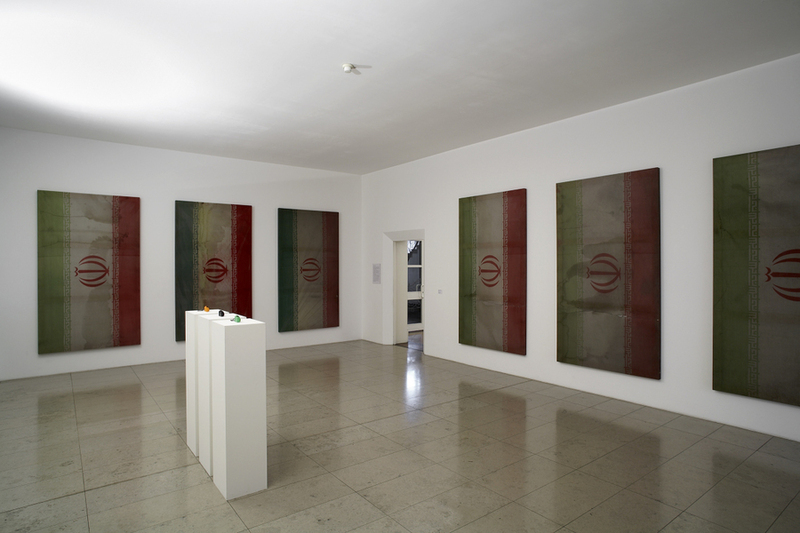 The unwillingness to settle for what is on offer, something that is evident in all her work, reflects Farhid’s views on the current state of society, politics and ideology. Though not overtly political, (for this inevitably enables privileged authority to manipulate the artist into the cul de sac of irrelevance), her work picks away at those daily familiar stabilising forces within the space of the everyday and also within contemporary art itself. Farhid’s work, eclectic and conceptually nomadic, uses the camera as a notebook collecting fragments of random events and chance meetings that collectively question the incessant drive towards normality and conformity. Farhid appropriates other ‘dumbing’ forms of popular media: soaps, reality TV, Bollywood, MTV, raw material welded together in fragments, each one activating and qualifying its predecessor. This process produces a contemporary surreal space that re-presents the familiar in that which is astonishing and invites the viewer to reconsider. In her most recent work Shallow Water, Deep Skin, featuring political activist and entomologist Shahin Nawai in ‘Shallow Water, Deep Skin’ Farhid reaches the apex of her observations of the human disconnect by melding together the swarming world of nature and human kinds’ own busy, teeming concerns. Most of all, Farhid turns out to be a quirky and humorous talent, who works as both artist and curator, resident and outsider. This interview was first broadcast from the ResonanceFM studios in 2008. This entry was posted in Six Pillars to Persia and tagged 2012, Art, artist, deep skin, exhibition, film, installation, interview, Iran, london, nooshin farhid, Persian, shallow water, Six Pillars to Persia, the agency gallery, use this kind of sky, vide on May 19, 2012 by sixpillarstopersia. Fari Bradley discusses shamanism, ‘beast visions’, social change and social cleansing with prolific artist Marcus Coates. Coates consulted with locals and developers alike to devise a shamanic intervention into the regeneration of Elephant & Castle and its Heygate Estate. 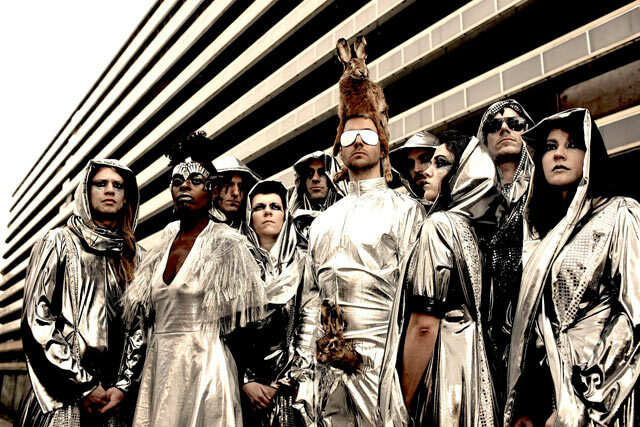 Coates’ interactions with the amazing array of characters around the Elephant and Castle culminated in a vision-ritual performance with 16 piece disco-Prog group Chrome Hoof at the iconic Coronet theatre. This entry was posted in Clear Spot and tagged artist, audio, chrome hoof, consultation, coronet theatre, elephant and castle, Fari Bradley, heygate estate, interview, marcus coates, nomad, podcast, regeneration, Resonancefm, ritual, shaman, vision quest on May 3, 2012 by sixpillarstopersia. Artist Terry Smith who since 1978, has produced major projects for the Tate Modern, the British Museum and galleries the world over, particularly in South America. 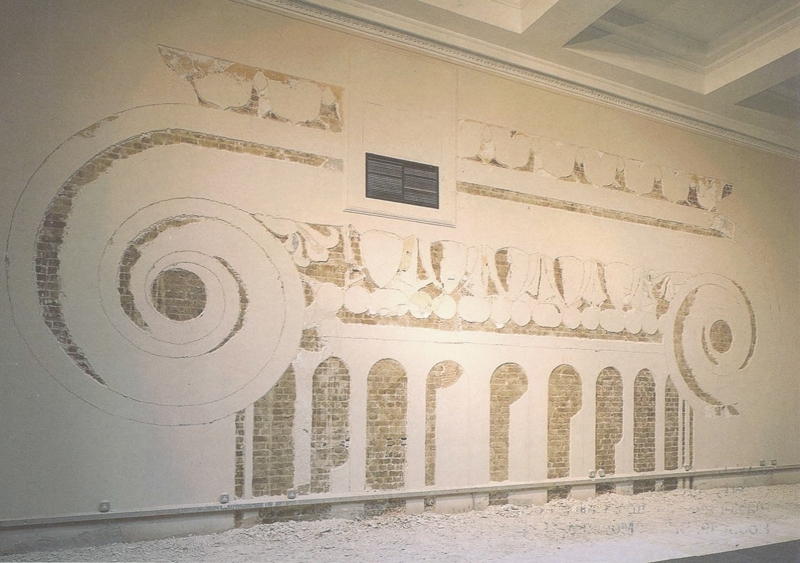 Known for his signature sculptures cut directly into the plaster of walls, mainly of derelict buildings – some with no public access – Smith is constantly experimenting with medium and has used film, audio and varied materials for his work. Winner of the Paul Hamlyn Award, Smith with his communist upbringing is at times renegade about his work. 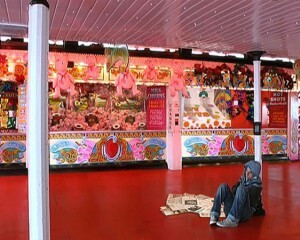 His wide choice of mediums have in common the resonances of the London streets he grew up in, his love of music, spontaneity and the challenges that come with constant questioning and experimentation. At Frieze this year Adam Curtis implored the artists of today to shock him with kindness, empathy and such-like qualities. Perhaps he is one of those who still haven’t heard of Smith, the artist’s artist. Recorded and produced by Fari Bradley. This entry was posted in Clear Spot and tagged adam curtis, artist, audio, British Museum, Fari Bradley, interview, podcast, sculpture, Tate Modern, terry smith, turbine hall on April 4, 2012 by sixpillarstopersia. An interview with award winning artist Mahmoud Bakhshi as he begins his three day residency and prepares for his historic solo show at Saatchi Gallery. The interview is translated by curator Vali Mahlouji, one of the people who nominated Mahmoud for the Magic of Persia Contemporary Arts Prize (MOPCAP) in the first place. Mahmoud Bakhshi draws inspiration for his works from the political and social issues that surround him. Born in Tehran, Iran, he is a graduate of the Faculty of Fine Arts at the University of Tehran, and has exhibited internationally since 2006. Mahmoud is also supported by the Delfina Foundation. This entry was posted in highlights, Shows, Six Pillars to Persia and tagged Art, artist, delfina foundation, Fari Bradley, interview, Iranian, london, Magic of Persia, mahmoud, Mahmoud Bakhshi, MOPCAP, Persian, prize, radio, saatchi, saatchi gallery, sculpture, Six Pillars to Persia, vali mahlouji on October 5, 2010 by sixpillarstopersia.